At ISLAND PACIFIC ACADEMY, we support the development of the whole child – academically, socially, physically and emotionally – from the Elementary school through the Secondary school and on to commencement. In the Upper School, students are supported in a nurturing and engaging environment that values authentic learning opportunities, rigorous scholarship, and continuing social and emotional support. Our Upper School program focuses on empowering students to define and navigate their own pathway to success, with the support and guidance from a caring faculty, counseling, and administrative team. 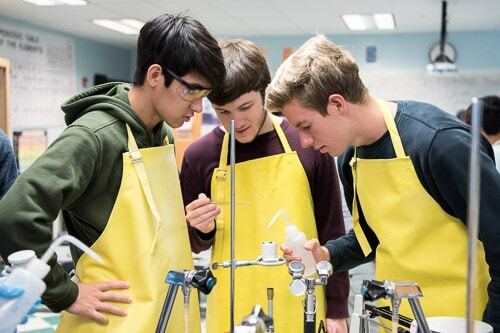 Students continue to develop research skills, writing skills, and critical thinking in all of their coursework and participate in active and authentic learning opportunities throughout their four years in the Upper School. One hallmark of our Upper School program is the 10th grade Passion Project in which students have the opportunity to pursue a year-long project of their choice, based on their interests and passion. This project not only leverages student passion to drive learning, but supports students in the development of self-directed learning skills. Grade 11 and 12 students have the opportunity to participate in the International Baccaulaureate Diploma Programme, which provides them a challenging and well-rounded education in preparation for college and university. Additionally, Advanced Placement courses are also offered. Students also have many opportunities to participate in clubs and honor societies and to take part in service learning activities within the community. Students work with faculty advisors to focus their efforts and document the number of volunteer hours that they participate in. Many students also participate in varsity or junior varsity sports each year. ISLAND PACIFIC ACADEMY has had many successes in the Interscholastic League of Honolulu and PAC-5 leagues. IPA’s Upper School program and supportive faculty focus on providing students with opportunities to develop both cognitive and non-cognitive skills necessary for navigating college, career and life beyond IPA. The 12th annual IPA Middle School Science Fair was held on campus on January 17, with 66 projects on display by students in Grades 6 and 7. Seventeen judges spent the morning interacting with the young scientists – listening to the oral presentations, asking questions about their methods and conclusions, and critiquing and providing feedback. 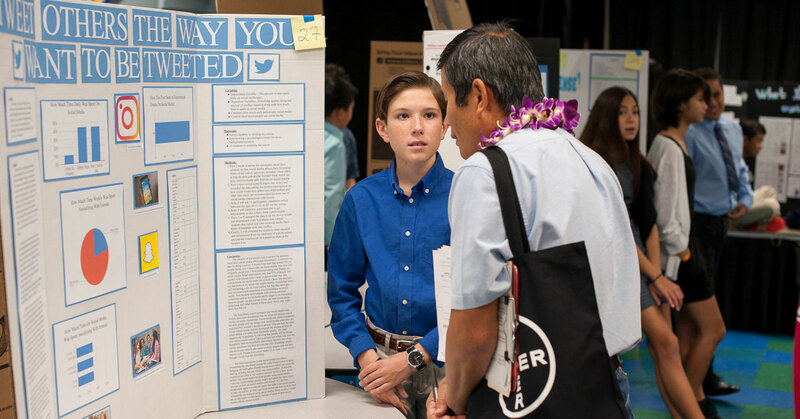 The top-scoring projects will advance to the HAIS District Science Fair in February.